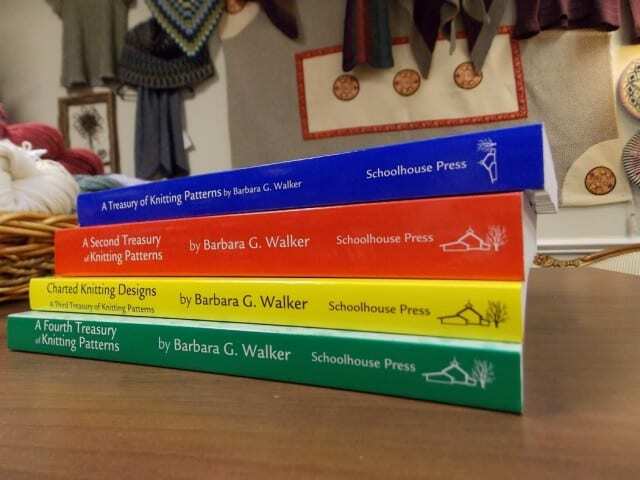 Speaking of classic knitterly tomes published by Schoolhouse Press: we recently reordered Barbara Walker’s stitch dictionaries, something we do every now and then to be sure that all four volumes are on our shelves at all times, if possible. 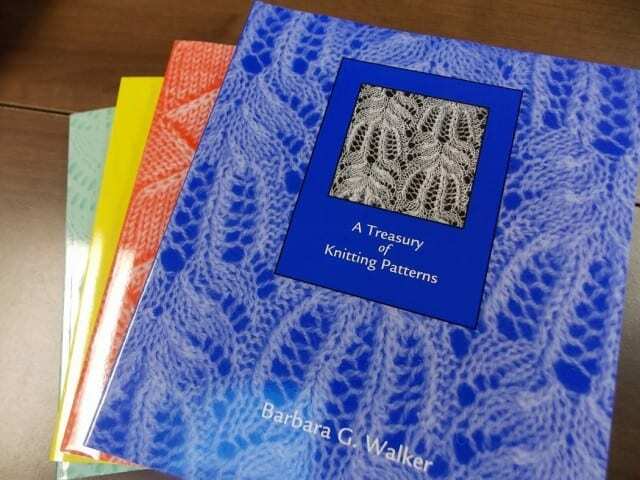 Barbara Walker’s A Treasury of Knitting Patterns is a treasure, indeed, a collection of stitch patterns ready to be plugged into whatever you can dream up: scarves, sweaters, blankets, socks–any and all of the things you can knit. 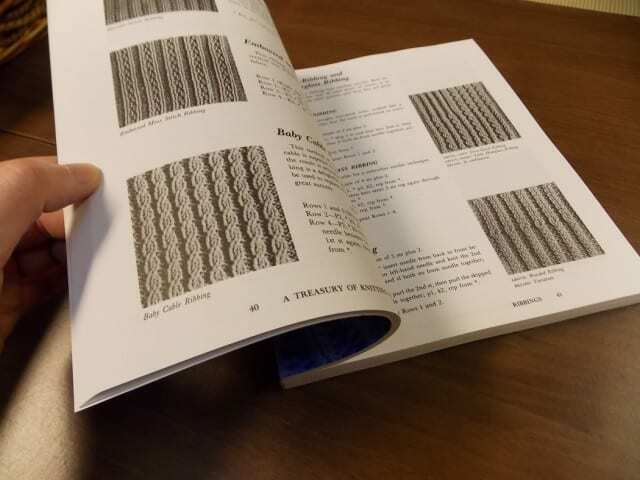 Walker gives written instructions (and in some cases, charts) for ribbings, texture patterns, cables, lace, slip- and twisted-stitch patterns, and two-color mosaic patterns, to name a few. A small black and white photo accompanies each stitch pattern, and Walker lists how many stitches it is to be worked over (e.g. “Multiple of 4 sts,” “Multiple of 17 sts plus 1,” or “Any number of sts”). Most also come with a short description that says how best to use said pattern, and what qualities the resulting fabric will have. 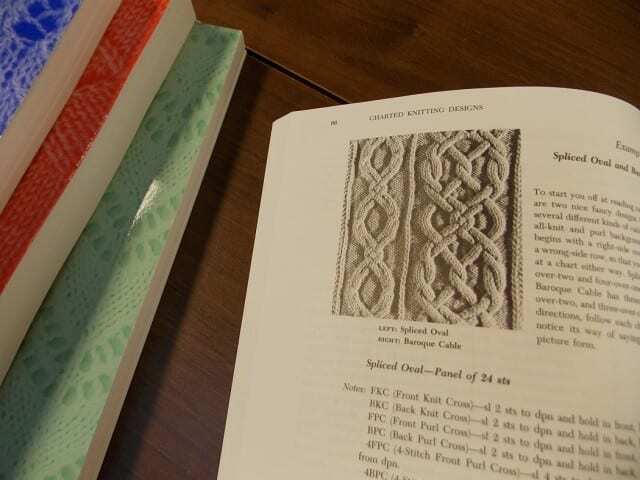 Early on in my knitting career, I recognized that these books would take me a long way, and made sure to add them all to my own little library of knitting resources. 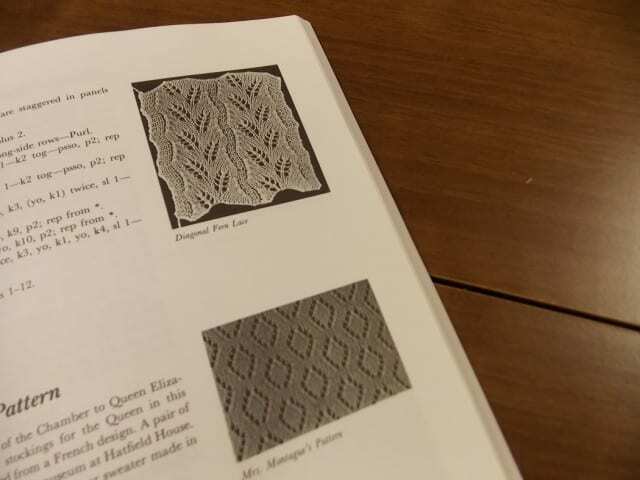 Although I was not yet skilled enough to work every pattern from these volumes, I figured that I might be, one day, and that trying a few of them here and there would be challenging and exciting, and teach me new techniques. I pull out my Barbara Walker treasuries often, thumbing through the pages, marking those that look promising for decorating the leg of a sock, the body of a sweater, a cowl or pair of mitts. They are truly inspiring books, and I’m always happy to have them on my shelf, reminding me of the limitless possibilities of this craft. Come by the shop to add them to your own library; you’ll find them on the top shelf among the reference books.